Today, we preview two more "Win and You're in" Breeders' Cup Challenge races. The Natalma Stakes features a deep field with 14, two-year-old fillies running a mile on the Woodbine Turf. For the winner, it's automatic entry into the Breeders' Cup Juvenile Fillies Turf race. From a handicapper's perspective, large fields bring more dynamics into play, mostly due to traffic issues. There's more bumping, checking, fading horses blocking lanes, outside horses needed to go wider making them run a longer race than the inside horses... the "Trip" can be everything for horses that get caught in the wash. Many times, it means the jockey that gets his/her horse in the best position wins, not the best horse. From our pro-subscribers' bonus commentary, "MY GAL BETTY won her last in easy fashion at 6-furlongs on the yielding turf. Despite the heavier footing, her fractions remained constant even with an additional half-a furlong. LA PELOSA is the morning-line favorite, getting Lasix for the first time, and pounded our 4th choice. ARTILENA hasn't run on the grass yet; however, trainer, Catherine Day Phillips wins at 29% with first time grass starters. She won her last on the all-weather-surface by 11. STILLWATER COVE must not like the food in England. She's got a 13th by 11 in Great Britain, sandwiched between two US wins." 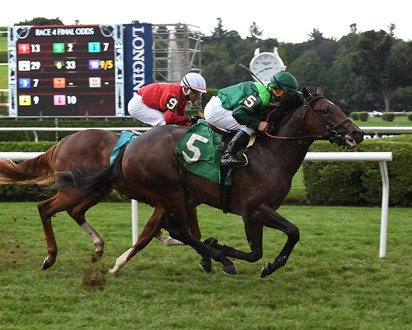 Many of the same factors are in play in the ninth with the Grade 1 Summer Stakes. It's another large field with 13 entrants of two-year-old boys running a mile on the Woodbine turf. This "Win and You're in" Breeders' Cup Challenge race is an instant ticket for the Breeders' Cup Juvenile Turf. Mile long, Woodbine Turf races tend to favor closers as off the pack horses win at 61% with only 7% going wire-to-wire. With the crowded field, we put more weight on horses that can run right off the early speed types. We focused on the mid-pack, early pace sort that don't take the lead from the jump yet show a strong stretch surge. This is how we see it, "FOG OF WAR showed the right Woodbine, turf running style in his debut, closing hard down the stretch for the maiden W. The extra distance should help. NASHTRICK won his debut easily on the grass, no reason he can't do it again. AVIE'S FLATTER broke his maiden on the all-weather-surface. If he can run the same on turf, then he should be in position to cash a check. TRICKY MAGICIAN will probably look like he has a chance until his final strides." GET OUR FULL CARD WOODBINE PICKS PLUS ALL OTHER TRACKS!